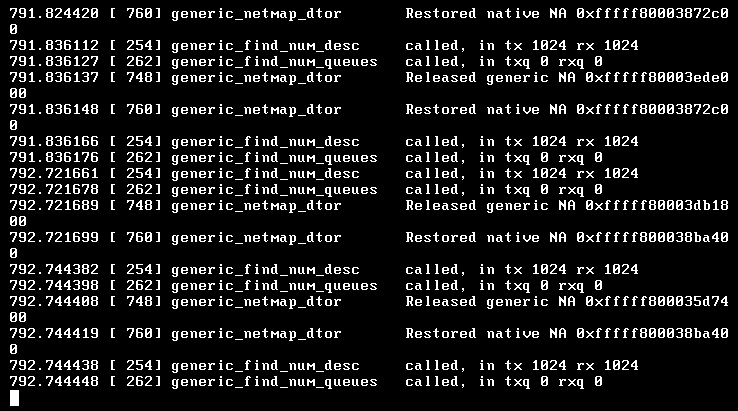 Hi all, i'm testing my NIC compatibility with inline mode / netmap, after few testing I ran into problems and receiving all sorts of error messages under different controls of native and emulated adapter mode via "dev.netmap.admode" system tunable. I have a PCI-e network adapter installed, it's a "Dell 0HM9JY Intel 82576 Gigabit ET quad port NIC (Intel PRO/1000 ET)" and I'm having issues with Suricata IDS/IPS while using "inline mode" that utilises netmap, pfsense is running as a guest VM and have another guest VM running Windows OS as a client (to trigger alerts), my host VM is running on a Windows OS (i'm just testing inline mode before deploying it). On my guest VM pfsense I have two network adapters - WAN is bridged and LAN is on a 'LAN Segment', the other guest VM on Windows OS has a single adapter connected to the 'LAN Segment'. On pfsense I have turned off 'hardware-based checksums', 'TCP segmentation offloading' and 'large receive off-loading', I've created and selected 'dropsid.conf' on drop sid list. I read that when you increase "dev.netmap.buf_size" from 2048 to 4096 pfsense stops receiving those error messages, although I'm not sure if that would break something else while fixing another thing. I don't know how to get inline-mode working properly with the NIC I have on a VM (vmware). Intel i340, i350/v2, i210, i211, i217 ,i219, PRO/1000, 82575/82576/82579/82580 and Realtek RTL8168B. I also read that PRO/10GbE adapters work with inline netmap but have massive throughput decrease. edit #2: I found a pattern on the client causing the error messages on pfsense. I'm still using inline mode, I was able to replicate the errors by doing a few speed test via speedtest.net. The only issue I have had is the netmap_grab_packets and the only adjustment I have done is the potential solution that you have read which has been running smoothly except for the one encounter mentioned. Of course, mine wasn't a VM. I will update my thread later this week. I would not mess with dev.netmap.admode nor try to "tune" the NIC…I have found that the tuning made things only worst. Be also sure to disable the items recommended in System > Advanced > Networking.